Bleank • View topic - Pen Pressure to Control Opacity? Pen Pressure to Control Opacity? I didn't see this yet in Black Ink, but can you set a brush's opacity to be controlled by pen pressure, just as you do the size of the brush? I may have missed it since I've only just installed the demo. Re: Pen Pressure to Control Opacity? Yes, you can modify any brush to have the opacity controlled by pen pressure using the controller editor. First, open the editor (the power plug icon just bellow the menus), and select the opacity output. 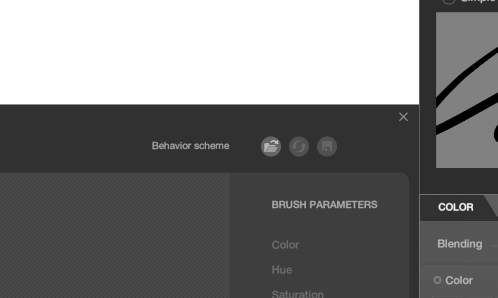 Then around the top right of the editor you'll find a "Behavior scheme" label with three icons. Click on the first one to open the preset window. Then choose the "Pressure func cubic" preset, click load and that's it, you have assigned the opacity to the pen pressure! You can do that for any parameter you like, or even get blocks from the folders on the left and create your own parameter behavior. And that's actually how every brush in Black Ink was made! And in the full version, when you have customized your perfect brush, you can save it and give it a name for future use. Thanks for explaining how to modify the brush to have the opacity controlled by pen pressure using the controller editor. I have read earlier that the controller editor can help is to control the opacity, but not aware how to do it. Your article was really helpful to understand the same. Last edited by raindropz on 28 Jul 2016, 12:23, edited 1 time in total. Even all these years of using this software I have never come across such an option. Was it included recently? I was shocked to find it now. Thankful to you in make me learn about it. I am sure it will be of great use.